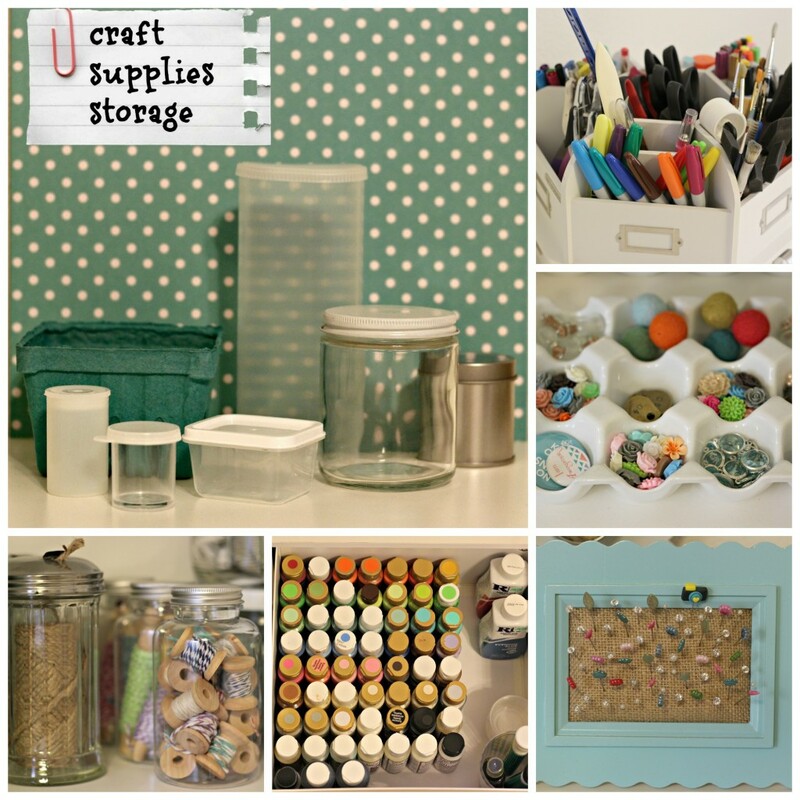 I shared my craft room a couple days ago, now let’s talk about craft supplies storage. My #1 tip for any kind of storage is edit, edit, edit. Edit first then see what you still have left that needs to be organized and stored. I know it looks like I have a lot, well, because I do. But since it’s my job I feel justified in probably having a little too much. You might want to watch for a craft stash giveaway in a few months. 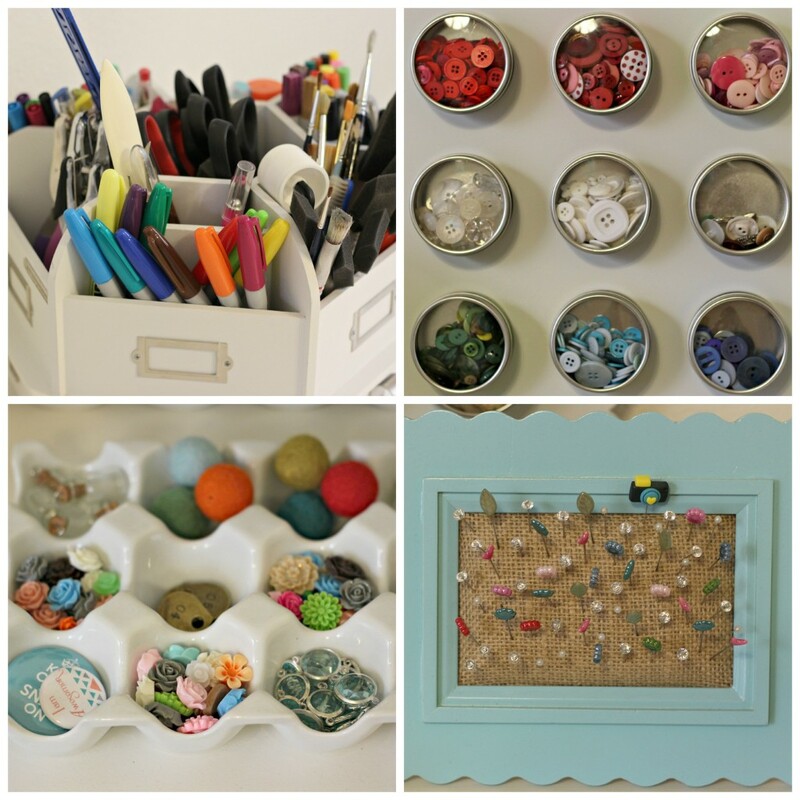 The lazy susan storage sits on my craft table so I have easy access to things I use often. I love all my colored pens and markers. The magnetic containers hold buttons used for sewing and crafting. I made the pin cushion using a thrifted frame, spray paint, burlap, and batting. The porcelain egg crate holds small baubles. 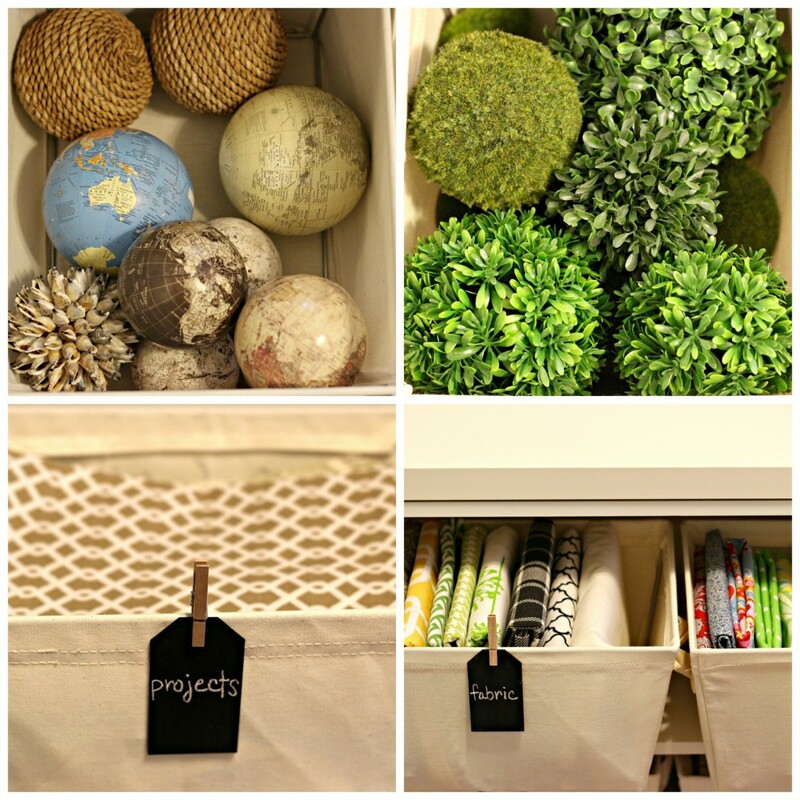 I store my items so they are easy to retrieve and keep neat. If something isn’t working I rethink it. Don’t be afraid to change the way you do something if it isn’t working. My vinyl rolls are kept in a shoe cubby along with decorative tape. I have 2 cubbies for scrapbook paper that I separate by color and pattern. The little suitcases are from Land of Nod. I took them from my daughter when she no longer wanted them. They hold small pieces of decorative paper, fancy envelopes, and postcards and old photos that I like to use in my decor. The Ikea garbage bag holder holds wrapping paper (not always used for wrapping presents). The bags hold gift bags, tissue paper and other gift wrap. Since there are no closets in this space most storage is out in the open. I like to keep things contained but still easily visible. That’s when glass jars come in handy. They hold almost everything on my party shelf, washi tape, and lots of small craft supplies. And since glass jars are clear I don’t have to use labels. 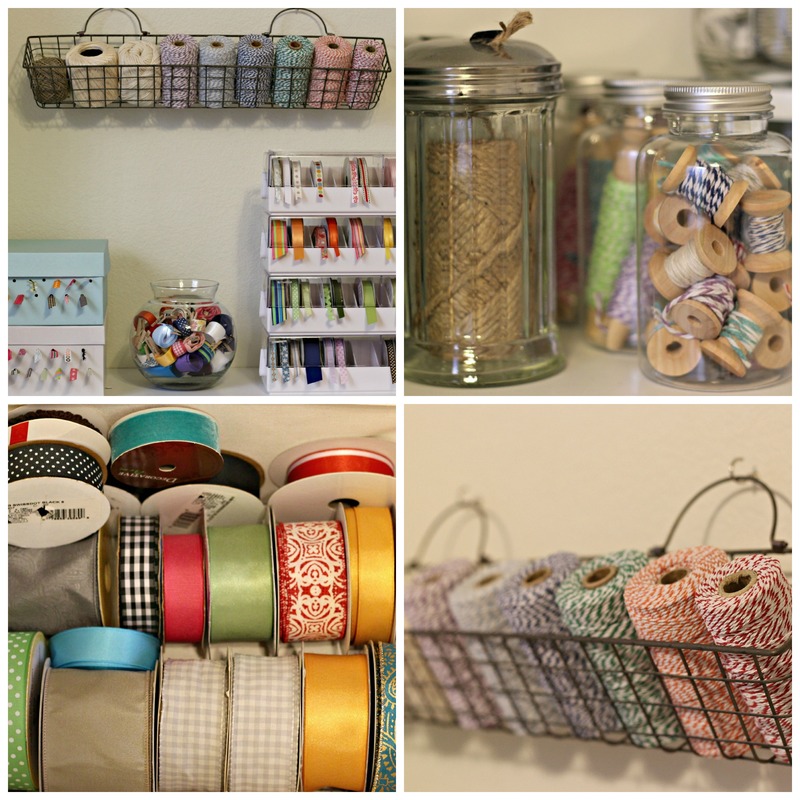 There are many ways to store ribbon and twine. 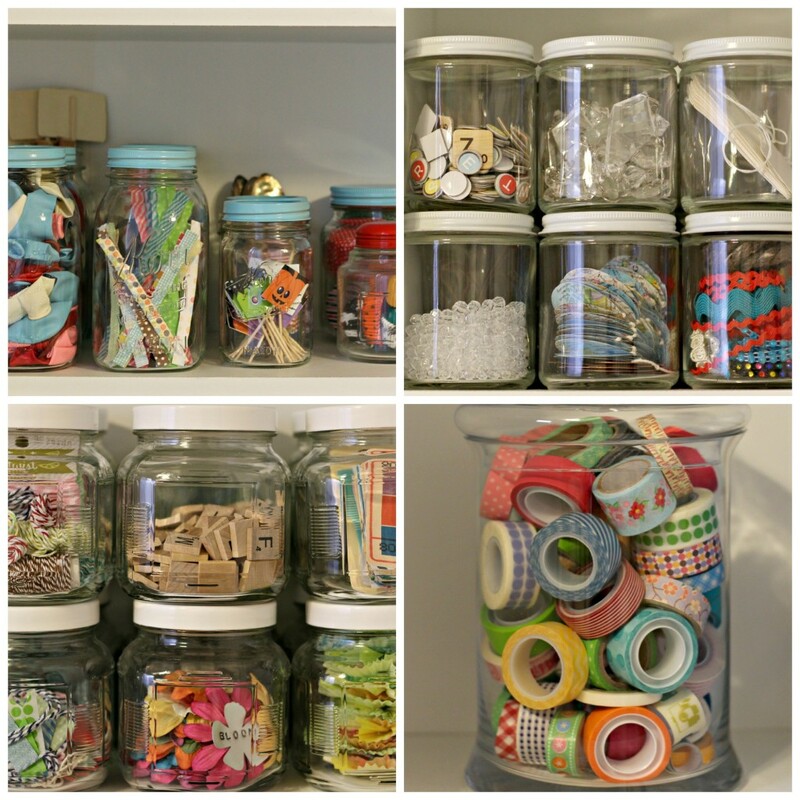 Here are a few ways I store mine: shoe boxes, glass fish bowl, ribbon organizers, old wire basket, sugar jar, twine wrapped spools in jars, and large rolls in a cloth bin. Some things need to be stored out of sight. There’s just too much and it can look cluttered. 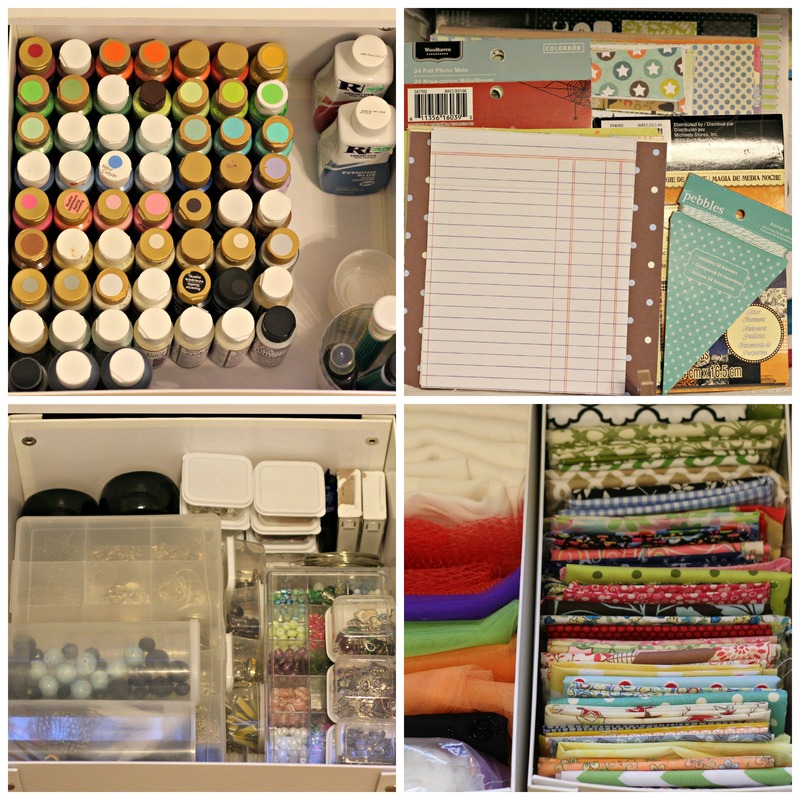 I have a hard time creating in clutter so I have to store some supplies in drawers and bins. I have one drawer just for the kids. They like to craft with me at times and this keeps all their things in one place. I try to store items in properly sized containers to keep things as neat as possible. If items are too small store them in little containers. I will share some of my favorite ones at the end of this post. Store like with like. Whether it be paint, paper, jewelry, or fabric store like things together and try not to mix them. 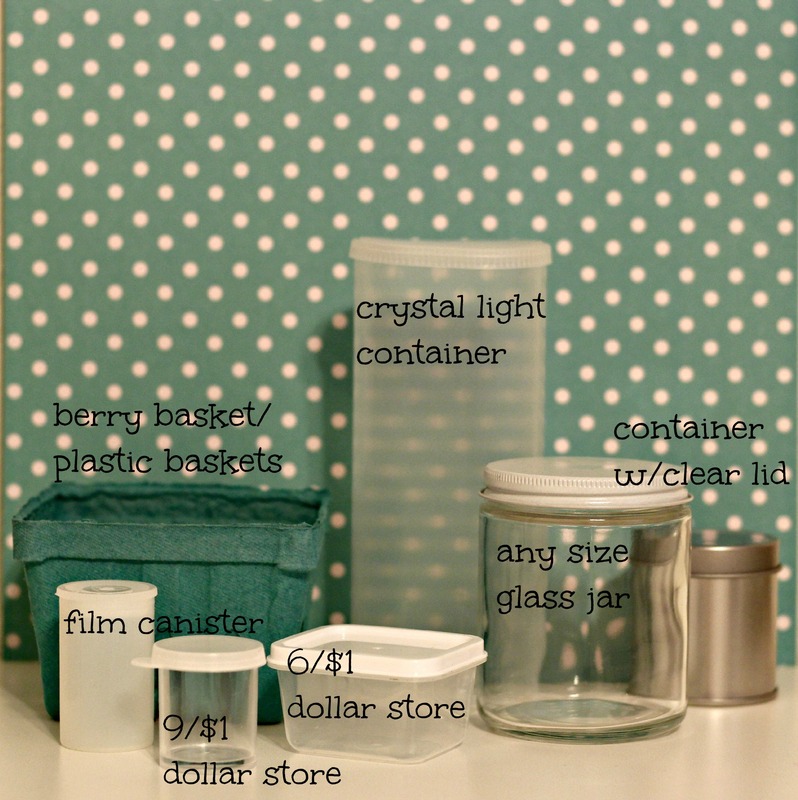 Also label the outside of non-transparent containers so you can quickly find what you want. I’ve stored most of my home decor in plain sight but there are a few things that had to be stored in bins to keep them well contained. I also have a bin for projects I’m working on right now or ones I want to start soon. And I have 2 more bins for larger pieces of fabric. Chalkboard tags are perfect labels since they can be changed easily. Here are some of my favorite containers I use to hold small items. 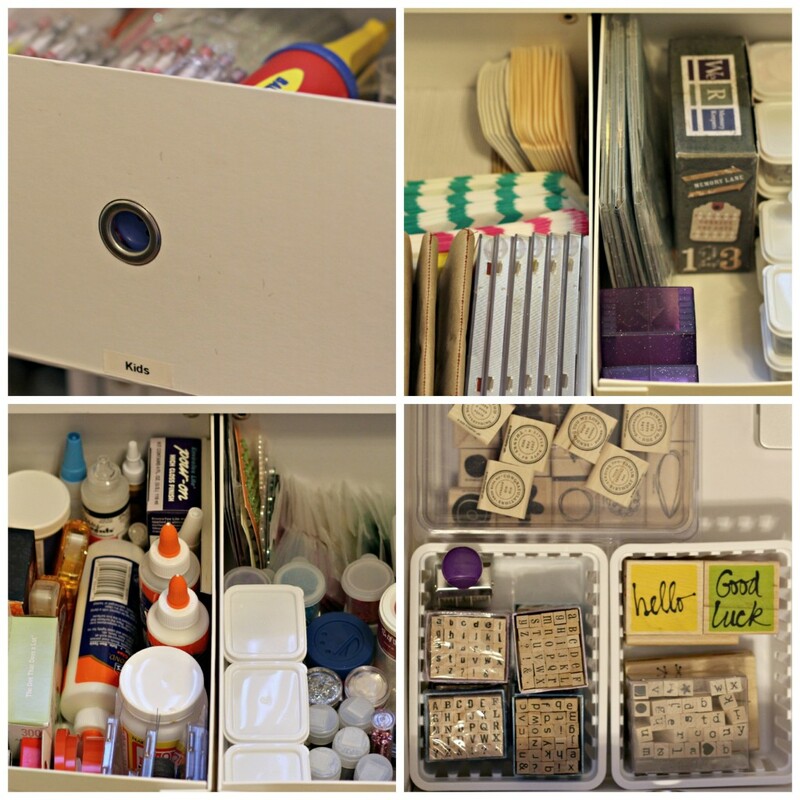 I use them in the drawers to contain even smaller items like buttons, glitter, jewelry findings, rhinestones, beads, scrabble tiles, stickers, chipboard pieces, die cuts, etc. 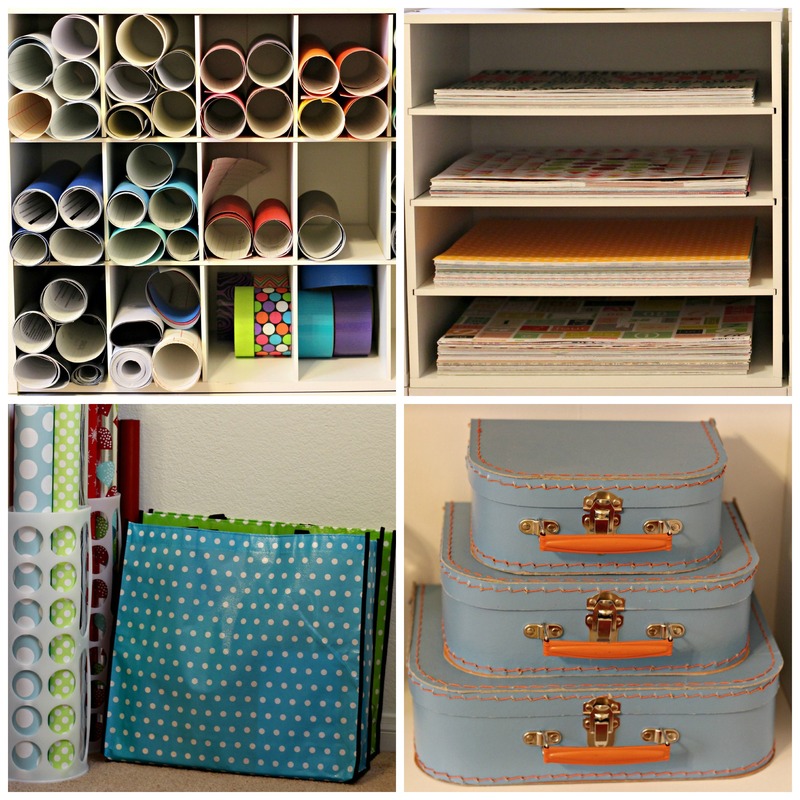 I hope this gave you some ideas on how to contain and store your crafting or any other supplies. I loved your post.. great.. I am from India and I do not get all the organizing materials available in the US, nevertheless its fun to see them and sometimes I do tell my sister who is in the US to buy those things for me. My husband keeps telling me that I need to organize my craft supply when we move in April. I had no idea how or where to start! This helps a ton. Thanks Leanne! I so need to do this. Thanks for the ideas. You are the queen at organizing! Seriously! So many great ideas here! Where did you get the cubby drawers?